Mother and daughter, O'Kemm Dixon and Annette (Dixon) Gustison, live in Carman. The two of them took "The Quill" along when they went to Reno, NV to bowl in the 2014 USBC Woman's Championships Tournament. O'Kemm received her Patch for bowling her 32nd tournament. Annette has bowled in 13. They try to see the sites whenever they go bowling. 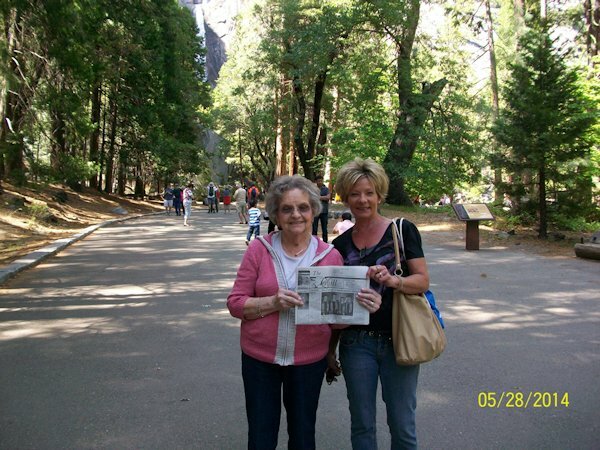 This year they took a cruise on Lake Tahoe and went to Yosemite National Park. Both are very beautiful National Parks. Yosemite Park is where the picture was taken, just below Bridal Falls.